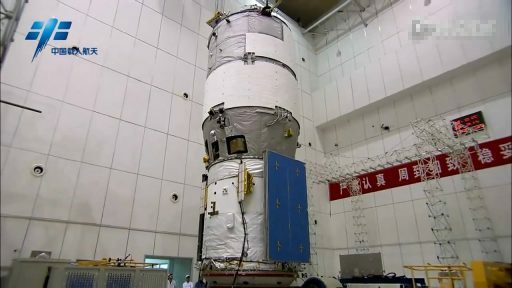 Navigational warnings show the launch of the Long March 2F rocket carrying the Shenzhou-11 spacecraft will take place around 23:30 UTC on Sunday from the Jiuquan Satellite Launch Center in the Gobi Desert, a launch time supported by the orbital geometry between the Shenzhou spacecraft and Tiangong-2 space station module. 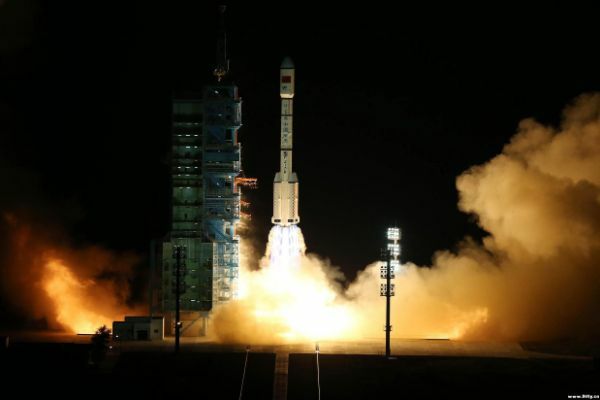 While China usually keeps its space flight endeavors under close wraps, the country’s crewed space program was the notable exception with regular updates provided through state media outlets. However, that seems to be different for this mission with official information on the crew’s identities, the exact launch time and flight plan not expected to be revealed until the pre-launch press conference the day before launch (~2:30 UTC on Sunday). 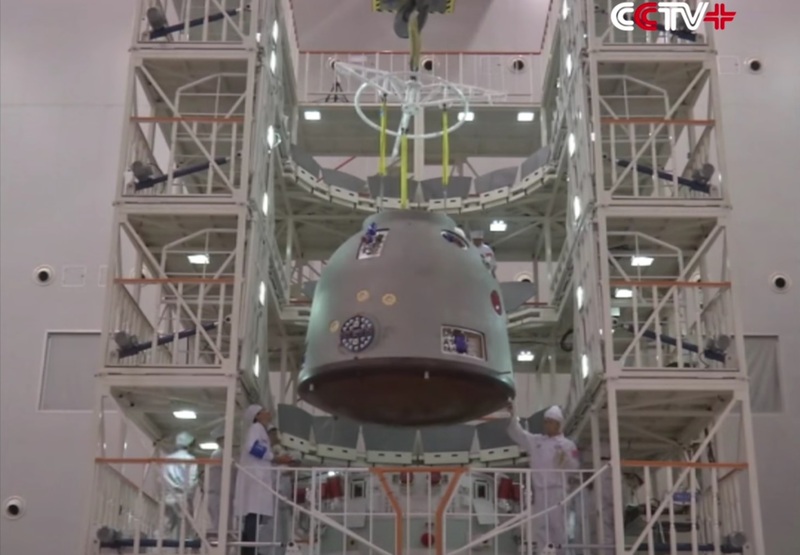 Shenzhou-11 will be the only crewed visit to the Tiangong-2 space laboratory – China’s second space station laboratory sent into orbit last month to build on lessons learned in the Tiangong-1 project that saw two crewed visits to the miniature Space Station in 2012/13. Tiangong-2 was built with threefold objectives in mind – a) continuing to advance China’s human spaceflight capabilities, b) demonstrating a cargo mission and in-space propellant transfer in preparation for future Space Station development, and c) serving as an orbital experiment platform hosting Earth and Space-Science instruments. Tiangong-2 – around 10.4 meters long and 3.35 meters in diameter – lifted off on September 15 atop a Long March 2F and enjoyed a flawless ascent to Low Earth Orbit. In the days after launch, Tiangong-2 fired its own engines to raise its orbit to over 380 Kilometers where it is now waiting for Shenzhou-11. The external and internal science payloads were activated for checkouts one week after launch, but most external experiments will be powered off for the crew’s stay. The Tiangong-2 spacecraft was designed to support a crew of three for a 20-day mission, but in a late change, it was decided to only fly two crew members and extend their stay to a full month which will more than double China’s previous record for the longest crewed space flight. Preparations for the Shenzhou-11 launch started at the Jiuquan launch base back on August 6 when the Long March 2F rocket arrived by train from its Beijing manufacturing facility. The spacecraft itself was delivered by cargo plane in mid-August to be assembled and fueled for flight before being installed atop the two-stage launch vehicle. Shenzhou – closely resembling the Russian Soyuz, although larger in size, flew for the first time in an unmanned test in 1999 and carried China’s first astronaut, Yang Liwei, to and from space in 2003 for a 21-hour flight. The first multi-day mission came in 2005 with a crew of two circling the Earth 75 times. The Shenzhou-7 mission in 2008 saw China’s first walk in space and was followed by a four-year gap in crewed launches while the focus was put on the development of a stepwise space station project. 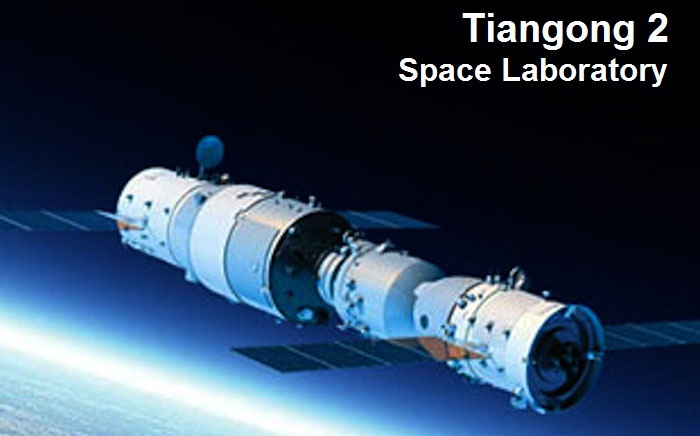 Tiangong-1 was launched in 2011 and first visited a month after its arrival in orbit by the uncrewed Shenzhou-8 mission that demonstrated China’s first docking in space to reduce risks for future crewed rendezvous maneuvers. 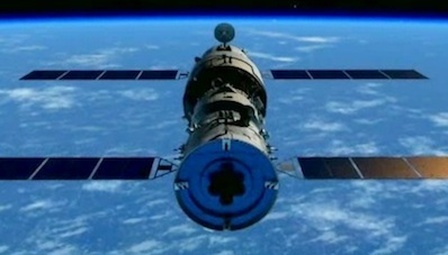 Shenzhou-9 delivered a crew of three to Tiangong-1 including China’s first woman in space followed by the SZ-10 mission in 2013 that set China’s current record for the longest crewed space flight at 14 days and 14.5 hours. 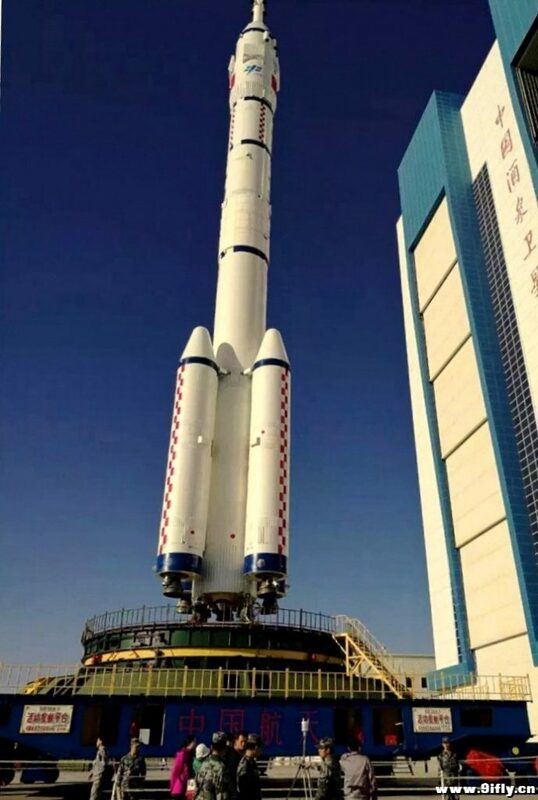 Tiangong-2 will be visited by two vehicles – the crewed Shenzhou-11 and the first Tianzhou cargo vehicle set for liftoff around April 2017 atop a Long March 7 rocket to demonstrate an operational capability to lift cargo to orbit and complete the transfer of propellants to the space laboratory – two critical requirements for the operation of a large modular space station with long-duration crews. 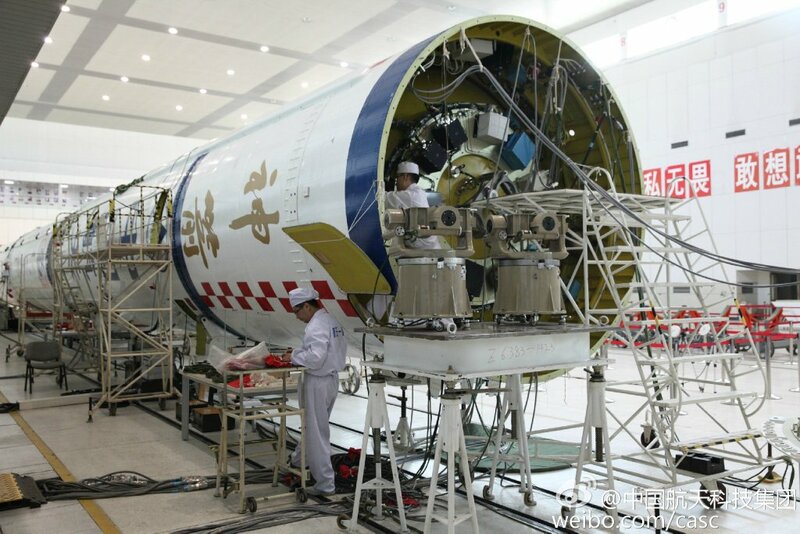 The Long March 2F rocket with Shenzhou-11 under its fairing was rolled to the launch pad back on Monday, but the event did not receive any coverage from official Chinese media in a departure from previous procedure when image galleries were available shortly after rollout. The two as of yet unnamed crew members and their backups would have arrived at the launch site on Wednesday to complete an ingress exercise at the launch pad and participate in pre-launch traditions. Based on China’s previous crew selection, Shenzhou-11 will be commanded by a veteran, possibly a crew member from the SZ-9 or 10 missions with docking experience, while the second seat could be occupied by a first time flier. 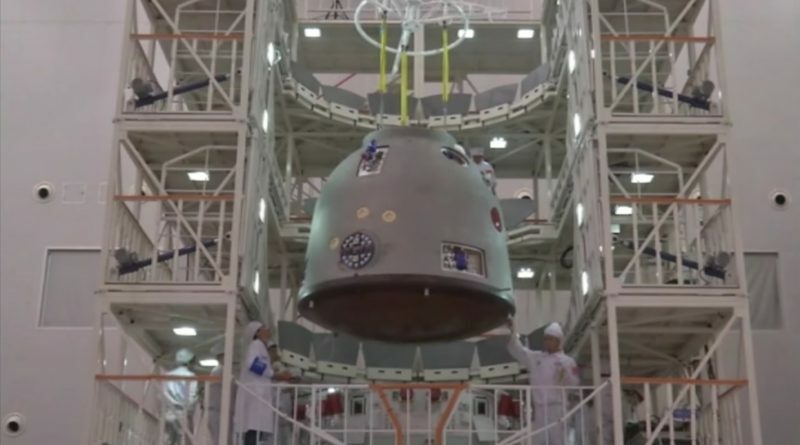 Lifting off from Jiuquan in the early morning on Monday (local time), Long March 2F will need nine minutes and 45 seconds to lift the Shenzhou-11 spacecraft into an orbit of around 200 by 330 Kilometers from where the spacecraft will begin its link-up with Tiangong-2. 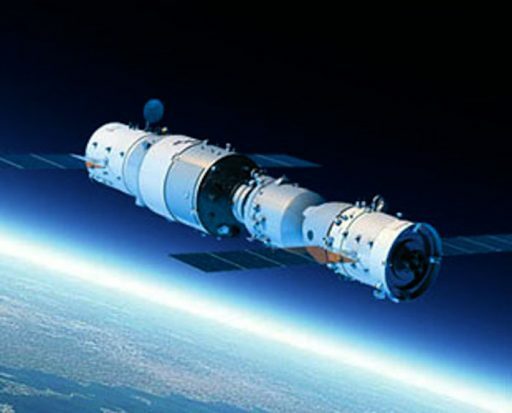 Docking will take place on Tuesday around 19:45 UTC based on the orbital geometry between Shenzhou and Tiangong. 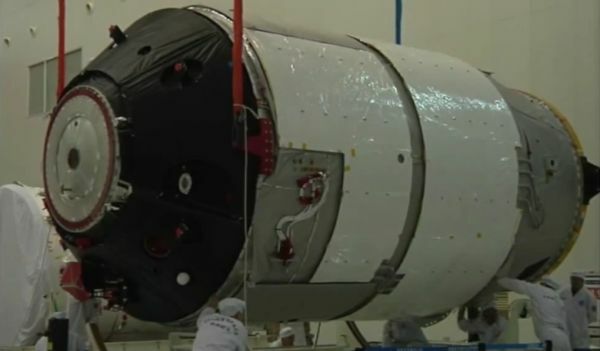 Spectacular images of the rendezvous and docking are planned to be gathered by the Banxing-2 satellite that launched attached to the Tiangong-2 space laboratory and will be set free to use high-resolution and wide-angle cameras to document the out-of-this-world encounter. Arriving aboard the space lab, the two crew members will be facing a busy schedule working on different experiments that are either already aboard the vehicle or are being delivered by the Shenzhou craft including human physiology studies, biological experiments, and technical demonstrations.